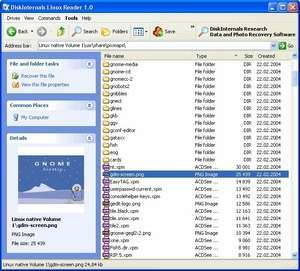 DiskInternals Linux Reader is a newly developed software tool for providing access to Linux file systems under Windows. You can use it whenever you want: the program is 100% free. It lets you use a familiar ambience of Windows Explorer for extracting information from Ext2/Ext3 file systems. The only type of access possible here is read-only mode. Version 3.4 is a freeware program which does not have restrictions and it's free so it doesn't cost anything. For security reasons, you should also check out the DiskInternals Linux Reader download at LO4D.com which includes virus and malware tests. Additional screenshots of this application download may be available, too.